Then, when I saw a newly released edition with notes from the author pop up in my recommendations on Amazon, I was instantly intrigued. Lo and behold, sequels were on the way! I purchased the trilogy again, but didn’t read it, fearful I would penetrate that nostalgic bubble and perhaps discover the series wasn’t as amazing as I’d hoped. Finally, after over a year of owning the book, I opened it up, read it, and will now offer my brief thoughts in the following microview with you, dear readers. I have written more on the themes found in the book on my philosophy and theology site. There are SPOILERS in this microview. Kathy Tyers’ The Annotated Firebird trilogy is undoubtedly a space opera. It spans several planets, three cultures, and the conflict in which they become embroiled. Firebird, the female protagonist, hails from a society with a monarchy that has developed a strong aristocratic power base while those in the lower classes are essentially serfs. She herself is a noble, but is far enough back in succession that she is considered a “Wastling” and is to dedicate her life to the eventual death in conflict or an honorable suicide. She is captured and falls in love with Brennan, a man with psychic abilities from a culture of people who have lost their home and believe in a coming Messiah. The series traces the path of these two–primarily through the viewpoint of Firebird–as their societies are enmeshed in a conflict which also involves the Federacy, a government of loosely joined planets in alliance. Political intrigue, themes of faith, prayer, and prophecy, and action abounds throughout the series. There is so much to love about this trilogy that I’ll name only a few major points. First, although Tyers uses the series to explore questions of faith, it is never preachy and the different belief systems presented in the book never feel as though they are a mere veneer for evangelism. Second, the story is extremely interesting as covers a wide range of locales which each are developed well. Third, the characters are entirely believable and experience genuine change and growth throughout the series that never feels forced. I have to commend this trilogy highly to you, dear readers. It was a real treat to re-read the series and realize that my younger self’s joy in it was well-placed. It is the kind of story that sticks with you long afterwards and the characters are both interesting and endearing. 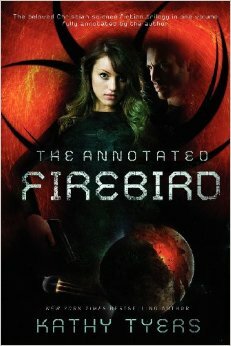 Kathy Tyers’ The Annotated Firebird is a stirring science fiction epic of faith and conflict in the far future. You’re crazy! Why would we not have at least 5 seats on the bridge for a crew of 2? A friend of Dr. Crusher’s comes aboard ship, but promptly disappears without a trace–even a paper trail. Wesley was apparently doing some warp field experiment around the time it happened. Time goes on and more and more crew members disappear, without anyone having any memory or any record of them ever existing. As the crew dwindles down more and more, Dr. Crusher races to figure out what’s happening. However, it turns out she’s actually the one trapped inside the warp field and Wesley and others are trying to rescue her. Finally, she manages to put her trust in the notion that “her” universe is not the “real” one and jump through a closing portal to safety. Once again, TNG proves it is capable of carrying episodes purely on individual character on the crew. Dr. Crusher is marvelous in this episode, as she deals with the sense of impending doom and possible insanity as people continue to disappear with only her realizing it. We as viewers know right away that it is almost certainly due to Wesley’s experiment (which, by the way, he never gets in trouble for–can we ever get some consequences for this guy’s mad scientist experiments? ), but the twist of having Beverly being the one who is taken rather than the others is what makes the episode really hit home. She has to figure out what’s going on from the perspective not of preventing it–her instinct–but of being the one trapped. That’s what keeps “Remember Me” going throughout, and it’s a great ride. The plot is really thin, but the mystery of it allows it to carry through the whole episode without ever feeling slow or boring. It’s a compelling episode that really only suffers from having perhaps too few elements. It’s great to finally have a really solid episode under the belt for Dr. Crusher. I enjoyed this episode immensely. The Enterprise comes upon a distress call from a Talarian ship. The Talarians are a warlike people, but Picard decides to mount a rescuing mission. One of the five people rescued, Jono, is a human and the grandson of a Starfleet Admiral. The crew starts trying to integrate Jono into human life, but he is resistant and insists that he is the son of a Talarian leader, Captain Endar. Endar shows up and demands to have his son returned, threatening to escalate to violence if needed to recover him. Finally, Picard decides to peaceably return Jono because he clearly feels he is part of Talarian, not human, society. The moral question of what to do with a young man who was kidnapped at a young age and raised in a different society was one of great interest, I thought. The episode interestingly conveys several different aspects of the problem while never trying to browbeat a point into the viewers, which is appreciated. It was great to watch Picard and Jono interact. Picard also hilariously said that people might not be aware that he’s uncomfortable around children. No, really? It probably won’t help that this child tried to stab him to death in his sleep. 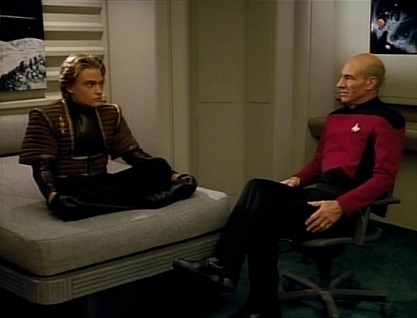 There are some flaws in the episode, as it is hard to believe people like Picard, Troi, and Riker who are supposed to be great diplomats would be so ignorant when it comes to thinking that this boy, Jono, could just be immediately placed in a different context and succeed. The plot also suffers from either too few or too many elements. That doesn’t make sense? Well what I mean is that either they needed to up the suspense further and perhaps have the Admiral speaking to Jono or some other ways to build the interest or they needed to really hone in on some of the specifics of the plot more. Nonetheless, this was an episode with many areas of interest and it explored a serious moral question in such a way as to make readers think further, which is always a positive. 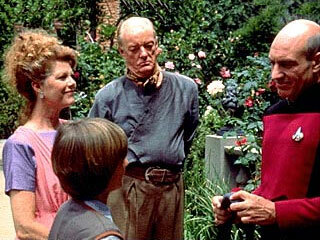 Contrast of two cultures… also notice how Picard is staying as far away from child as possible. Kids + Picard = sad. A young boy plays a prank that seriously injures his brother. The Enterprise tries to race home, but Noonian Soong, creator of Data (and other androids) summons Data to provide him with an emotion chip. Data hijacks the ship and uses it to get to Soong. Soong’s summons also called Lore, however, and Lore arrives bitter that there is nothing for him. He steals the emotion chip and fatally injures Soong. The crew of the Enterprise arrives to get Data and they get the boys to a space station to save him. Data sees their reconciliation as a sign of hope for himself and Lore. There is a lot of great story building for Data in this episode, as we find out more about his origins and the ways in which he and Lore are connected. It’s kind of an exciting premise too, as it makes us wonder what other “triggers” could be planted into Data, who really seems unstoppable when it comes down to it. But this point leads to some of the difficulties with the episode as well. I think we as viewers have to wonder whether Starfleet would be even more worried about Data than they’ve shown so far. The interactions with Lore consistently portray him as crafty and evil (or mad? ), but it is also hard to see him consistently making mistakes that undermine him later. The juxtaposition of the two stories of two brothers is interesting, though I think it could have been used with even more effectiveness throughout. It was good plot device that wasn’t used as well as it could have been. The Enterprise rescues a human youth who was among a crew of Talarians–a warlike, xenophobic people. It turns out he was captured on a raid some time ago and a Starfleet Admiral is his grandmother. They decide they must return him to his human family, but Captain Endar, a leader among the Talarians views the boy, Jono, as his own son. The crew of the Enterprise tries to integrate Jono into human society with limited success as Endar threatens to escalate into war to retrieve his son. Picard finally decides that the boy’s choice to identify as Talarian and son of Endar must be respected. Honestly, on later reflection I think I liked the episode a little more than the grade I initially gave it (see below), but I have a policy of going with your initial gut feeling on such things (just like multiple choice tests–don’t second guess yourself!). Anyway, as Season 4 continues its focus on familial relations (what with “Family,” “Brothers,” etc. ), we here have an episode dedicated to the drama of adoption, identity, etc. It raises numerous interesting questions of right and wrong regarding cultural norms and practices, and surprisingly has a satisfying feeling at the end (rather than a contrived one). Picard’s interplay with Jono has moments of comedy, but sometimes feels a bit overdone. It was great to see much of the main cast talking with Jono and to see the escalation of the possible conflict. The pacing is a bit slow, and there seems to be some relative naivete regarding yanking Jono from his culture and slapping him into human society whence he came. Troi, thankfully, shows some awareness of this but doesn’t fully pursue it. It’s a good episode that maybe just doesn’t shine as much as it could because of a few minor flaws. I have embarked on a quest to read through the Star Wars Expanded Universe once more. After reading Darth Plagueis (click title for link to review), I decided to take it back to the beginning–that is, where I began reading Star Wars books. 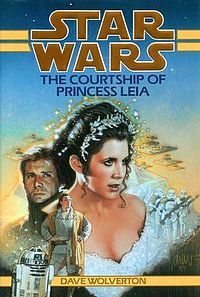 That means I will now review The Courtship of Princess Leia, the book that got me started in the Star Wars Expanded Universe and a quest that has continued for 20 years (and continuing). The Courtship of Princess Leia centers around, surprisingly enough, Princess Leia and a Hapan Prince, Isolder and the marriage proposal between them. Han Solo is less than impressed by Isolder and decides to have his own go at convincing Leia to marry him. I’ll not summarize the whole plot, as you can instead find a summary here. The book has a number of awesome things in it, like reading about Han Solo talking to C-3PO about how to win women and watching his pursuit of Leia. Leia also shines as she continues to overthrow any notion that women have to be submissive and quiet. The introduction of the Hapans was intriguing and leads me to want to read more about them. Having the side plot of Luke Skywalker trying to restart the Jedi Academy was also great. There are also some flaws. First, the Force seems way more like magic than like the Force does in either the movies or later books (from my memory). In one scene, Luke goes into a Force trance instantly, falls out of his X-Wing, and then uses the Force to basically fly as he slows his fall to the ground and lands. I don’t remember the Force granting some of these abilities later. He also uses the Force to seamlessly translate what anyone is saying. I don’t know, maybe I’m forgetting something but it seems like they nerfed the Force later. Second, the droids in the book seem to be fully realized persons rather than acting like droids! C-3PO in particular is given a whole mental life, something that I recall being largely absent later. It feels a bit forced in many places, to be honest. The whole plot with the Witches of Dathomir has its ups and downs, but Wolverton did a great job introducing a fully realized world and society for exploration, something that is not an easy task. The book just has a great Star Wars feel despite the negatives I mentioned above. The Courtship of Princess Leia is by no means perfect, but it remains a great entry point for those looking to read through the Expanded Universe and it remains on my list of favorites. Is some of that nostalgia talking? Of course. But isn’t nostalgia part of the reason we all love Star Wars anyway? -Did I mention Han Solo? C-3PO composing a song dedicated to how awesome Han Solo is. I can’t believe I didn’t remember that epic scene. The Courtship of Princess Leia is a solid entry and a good starting point for Star Wars fans interested in reading the EU. I would highly recommend a read-through for Star Wars fans. Please let me know if you have any ideas for categories I should include in these reviews going forward. Time for some tough love, Picard! Picard remains a Borg as the Enterprise attempts to keep stride with the Borg cube heading towards Earth. The Borg use Picard’s knowledge as Locutus of Borg to massacre Starfleet at Wolf 359, but Riker formulates a plan to recapture Picard by sending an away team in under cover of sci-fi magic. Data integrates himself into the collective and discovers that he can input a code into the collective. The order to sleep is integrated into the Borg and the self-destruct, causing Picard to return to his humanity in the process. Look, TNG can do two-part episodes that end well! Seriously, though, this is a phenomenal episode. There is all kinds of awesome action with the chase of the Borg Cube and the destruction of the (pathetic) Mars defense perimeter (seriously, we need better defense for Earth, people!). The action, however, really serves only as a drive for the drama, which is found throughout. The continued tension between Shelby and Riker is interesting, but the real star is once again Picard. There are two scenes which really show how incredible Picard’s character is. There is a scene that shows Picard still on the Borg ship and they are adding components to him. A single tear goes down the side of his face. That tear does more emotionally than many speeches could have done. The investment that TNG has placed into its viewers through Picard’s continued characterization pays in dividends in scenes like this. We, as viewers, can intuitively sense what’s happening in Picard’s mind at this point, knowing that he is feeling great remorse but is being controlled. The scene at the end also brings Picard’s character into focus powerfully. We leave him staring into the vastness of space, surely a man who has been changed forever. This is a great episode, and one which deserves its place among the fan favorites. It’s a reminder of what makes Trek so great. The Enterprise is set for some maintenance and shore leave on Earth is granted. Picard goes to visit his family while Beverly Crusher recovers some items from her deceased husband. Worf’s family comes to the ship to visit. Picard and his brother don’t get along. One of his friends from Earth tries to get him to join a development project. Dr. Crusher finds a recording of her husband intended for Wesley, while Worf deals with balancing his shame from his Klingon lineage with his human lineage. Picard and his brother fight, leading to reconciliation. Wow. I gotta say I’m blown away by how excellent this episode is. I always thought it was super boring, but I haven’t seen this one since I was probably around 13-14 years old and the impact of it didn’t have the force it does now. (Well, that makes me sound old!) This time watching “Family” was an just an incredibly impactful experience. Worf’s family is delightful. His parents dote on him, which is just the opposite of what one may have expected for people who would adopt a Klingon. To see Worf’s father get so excited over the Enterprise and have him talk about how he read all the manuals is just a great touch, and his mother’s understanding alongside his father’s rambunctiousness is just a perfect balance. His interaction with them also brings in threads from earlier (like Sins of the Father) and provides viewers with reflection alongside great character development. I don’t honestly remember if his parents show up again in the series (I’m pretty sure they do), but I’m hopeful. They’re great. Picard once more carries the episode, however, as his struggles with his brother, indecisiveness about his future, and Post Traumatic Stress Disorder (never called that) all come into play. The scene in which Picard finally snaps and starts beating down Robert after being pushed into it is one of the most amazing moments in the series so far, as he breaks down and cries; “I should have been stronger.” His brother’s reaction is unexpected, but perfect: he basically just says “Deal with it. It will be hard, but deal.” Although they are harsh words, the implication, however, is that Robert will be there for Picard. They don’t like each other, but they do love each other. Wesley’s side plot is also worth a mention as he learns more about his father through a holo-recording. It’s a touching moment that stands on its own right. “Family” is one of the best episodes so far in TNG. At this point, that’s really saying something. TNG shows, with this episode, that it is fully capable of standing purely on the strength of its characters’ stories.